The city animates itself to make the new Olympic Stadium possible, all together. 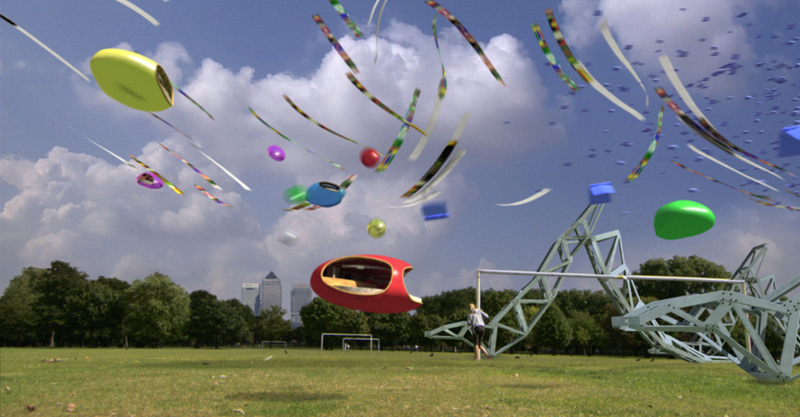 "Olympics 2012" is an unique mixture of technical and fictional perspectives. The knowledge of visual communication and architecture, the skills of the studio in computer-generated visualizations and interactive content allow Squint/Opera to communicate architectural possibilities in new narrative ways. Squint/Opera's work not only deals with the description of architecture to the widest possible audience, but also about the communication of whole events connected to those particular projects. Five years earlier "Olympics 2012" began advertising the Olympic Games of 2012 in London. Squint/Opera was commissioned to generate the announcement of the design for the Olympic Stadium (by Populous, formerly HOK), the film in 2007 achieved worldwide news coverage and was run throughout the day on BBC News 24 with great success. As usual their principal aim is to tell a story that reaches the public's imagination, by 'hiding' in plain view technical information about the project within an entertaining and funny frame. In "Olympics 2012" the stadium's elements are transformed into living creatures with detailed animations that are followed during the whole video in a semblance of "live" footage.